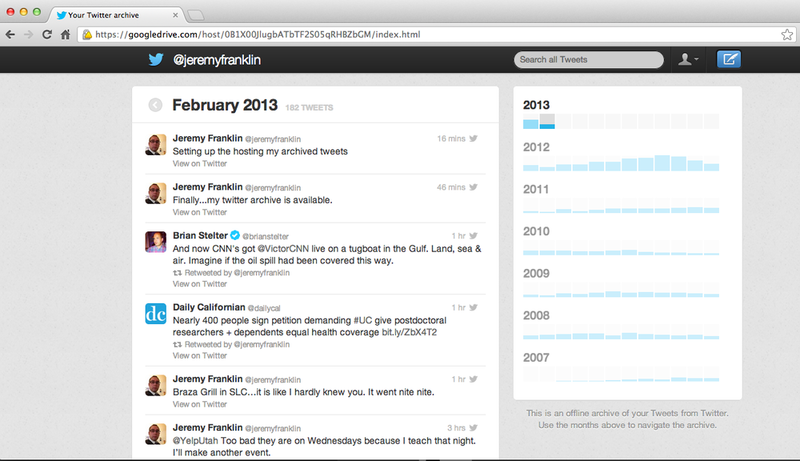 My Twitter Archive Is Here...Now What Do I Do? Just when I had given up hope of ever being able to download the archive of my Tweets a little message directing me to download my Twitter history popped up in my email. I proceed to download the package of files, but I wanted to host my history somewhere and have the file auto-update. I came across this handy tutorial on how to host your Tweets on Google Drive and get the file to auto-update. The tutorial fairly straightforward (video included) and should only take a couple minutes. Check out my archive here and post the link to your archive in the comments.